Want to tickle your taste buds with a good, old-fashioned burger? How about an exotic twist on the classic? Staunton restaurants have elevated hamburgers from the filler section of the menu. From reliable diner burgers with unusual toppings, to scrumptious pub fare, to fine dining, to meat alternatives, Staunton burger joints offer something for just about any taste. Located in the old train station in the historic Wharf District, The Depot Grille has two yummy burger choices on its menu: the bacon cheddar burger and the mushroom swiss burger. Both can be made to order and you can even substitute bison if you want a change of pace. If you’re lucky, the Polyface Farms burger will be on special. This burger showcases grass-fed beef, pepper-jack pimento cheese served on brioche. Belly up to the 40-foot antique bar if you want a bit of history with your meal. Both tourists and locals continue to flock to The Shack for its award-winning food, and even a burger from the ever-evolving menu is something special. A current offering features cheddar, marrow roasted onions, dill pickles, black garlic mayo, and bacon. This small restaurant cannot accommodate parties of more than five. Reservations are strongly suggested. You might visit Bedlam Brewing, a small-scale microbrewery, for the beer, but don’t leave without exploring the food menu as well. This hidden gem focuses on incorporating local produce and locally-raised livestock in its meals. Let Bedlam tempt you with its sliders, a delicious pair of beef and pork burgers topped with cheddar, bacon, and spicy mayo, and accompanied by pub fries. All this and a killer beer list as well? You won’t regret it! Food at Table 44 tastes amazing and the presentation is wonderful, too. If you’re looking for a burger, you can’t go wrong. The “Southern 44” burger enhances a standard burger with barbecue pork, pimento cheese, barbecue mayo, and jalapeno peppers. Another tasty pick is the “Bacon & Blue” burger topped with bacon onion marmalade, barbecue mayo, and blue cheese. For those who don’t fancy meat, the black eyed pea burger with jicama slaw and garlic aioli on a gluten free bun is a delicious choice. Follow your meal with a sweet treat from the Paris Cake Company. Try a delicious burger at Mill Street Grill. Enjoy a generous ⅓ pound mix of ground sirloin and filet mignon cooked to order with a large selection of optional toppings including avocado, mushrooms, and havarti cheese. 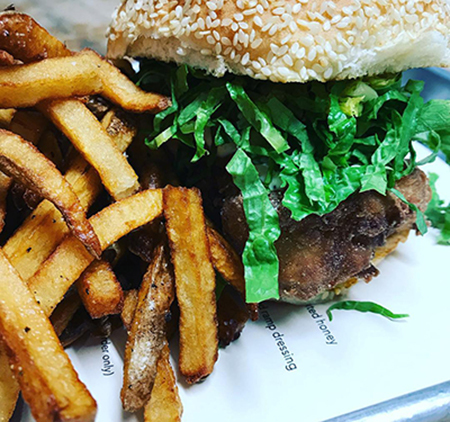 If you’re not feeling the beef, Mill Street also offers a turkey burger option and a spicy black bean burger served with grilled onion, guacamole, lettuce and tomato, and cilantro-citrus mayo on the side. Complete your meal with an extensive appetizer menu and a full selection of wine, beer, or drinks from the bar. Is your stomach rumbling for a tasty burger for lunch? Byers Street Bistro has three interesting options on the menu, all made with Angus chuck. The “Bistro Burger” is topped with grilled mushrooms, bleu cheese, garlic mayo, and red wine butter. The “Bacon Royale Burger” incorporates candied bacon, bacon aioli, and smoked cheddar. The “Wharf Burger” uses soy-glazed mushrooms, swiss, white truffle mayo, and fried onions. Hungry yet? If you’re looking to complement your Mexican meal, look no further than the Baja Bean’s “Baja Burger.” This burger, made with cheddar, bacon, mushrooms, and jalapenos, comes with a side of beans, rice, or fries. Make your meal a celebration by ordering one of Baja’s 12 carefully curated craft beers on tap. Don’t forget to order fried ice cream for dessert! Try the Clocktower Food & Spirits “Downtown Burger,” made with fresh Angus and lettuce, tomato & red onion on a grilled pretzel roll and served with house-made potato chips. Order beer-battered onion rings or sweet potato fries to go with it. Originally this building housed the second YMCA built in Virginia. Much of the original clock in the tower remains, though some parts have been modernized. Listen to it ring on the hour during your meal!